The cataract is one of the most common causes of vision blurring after a certain age. 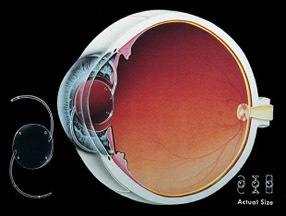 The cataract is a degenerative process of the crystalline lens. All people after a certain age have a clouding of the lens. 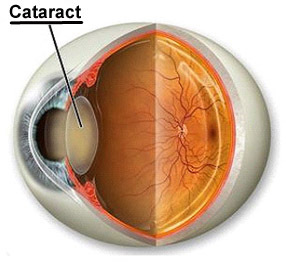 For the cataract there exists no other treatment except surgery. The cataract surgery to remove is the most common and most successful surgery in the entire area of medicine. A cataract is a clouding of the natural lens of the eye. The natural lens of the eye behind the iris has the size of lentils and is normally clear. It cannot be prevented or cured with medicines. It is a very common condition and usually occurs with a certain age. Sometimes it can be caused by trauma, certain diseases (e.g. diabetes, inflammation of the eye etc.) or drugs such as the chronic use of cortisone. In very few cases can a child be born with cataract (congenital cataract). Blur with a progressive reduction of vision for distance or near. The vision becomes less clear. Glare and reflections around some objects. Severe discomfort in the sun. Driving, especially at night or in very bright light. Reading or watching TV. In some cases, in the early stages of some types of cataract, reading without glasses is achieved. Sewing or other hobbies that require detailed observation of objects. When should cataract operation be performed? The procedure can be decided when the cataract begins to cause such disruptions of the quality of vision, resulting in problems in daily activities (safe driving, reading, TV). Based on your symptoms, you and your eye doctor should decide together when the surgery should be performed. It is no longer true that cataract need to be ‘ripe’ for extraction. With new surgical techniques (phacoemulsification), this concept belongs to the past. On the contrary, in fact, removing a hard overripe cataract makes the surgery more difficult and complications may present. The eye examination before the surgery is performed to determine the overall condition of the eyes, the type of cataract and to make the necessary measurements that will indicate the correct lens that will be implanted into the eye. A detailed eye examination including measurement of vision and corneal curvature, measuring the eye pressure and examination of the retina. With the ultrasound the length of the eye gets measured and the power of the lens to be implanted during the operation is being calculated. How is the cataract surgery being performed? Nowadays, the cataract is removed using the technique of phacoemulsification. Through a small incision of 3-4 mm and with the help of ultrasonic through crushing and absorbing the cloudy lens the cataract gets removed. In the end, an artificial intraocular lens is being implanted, which is permanent. The operation ends without the needing of stitches. The eyesight recovers faster with this technique. Nowadays hospitalization is not required. The patient goes home immediately after the surgery, and returns to his daily activities the next day. The surgery is performed under local anesthesia with eye drops and the patient leaves the operating room without a protective pad. The lens which is placed inside the eye has the ability to correct the myopia or hypermetropia that existed before the surgery, so no glasses for the far distance are needed after the surgery. In a small percentage of patients a small correction with glasses for certain activities (driving, television) is needed. The approach to the postoperative correction should be discussed with the surgeon in order to meet the demands and needs of the patient. It is always recommended that the patient is accompanied by a relative who will transfer him to and from the clinic. The residence time in the clinic will be 2-3 hours inclusive the preoperative preparation. The previous night the patient should have a light lunch and the morning a light breakfast. The usual medicines (for blood pressure, heart, diabetes) are necessary to be taken, except anticoagulant agents as aspirin. The patient remains for recovery for a while and leaves the clinic when he feels well. The ophthalmic surgeon will provide appropriate eye drops, which will be used at home after the surgery and gives appropriate instructions. It is important after the surgery that the patient should not rub the eye and not get water in the eye for a week. It is best to avoid also lift weights and do intense physical activity the first 3-4 days. What are the advantages of the method? The technique of cataract removal through a tiny incision offers many advantages. With this technique, the patient returns to his daily activities the next day. No hospitalization is required. For the surgery neither general anesthesia nor anesthesia needles are used. No sutures are placed during the surgery. The stitches can be troublesome and can cause astigmatism. The incision heals faster and more naturally. All these result in fewer potential intraoperative and postoperative complications, resulting in faster recovery of vision. During cataract surgery the outer shell (capsule) of the natural lens is left behind to hold the artificial lens (implant). Over time, in most patients, this outer shell becomes cloudy. This condition is called a secondary cataract. You will notice your vision will become blurred like it did with the original cataract. 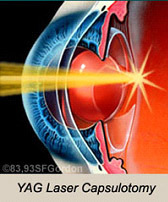 In this case, we use a special laser beam that breaks painless the blurred membrane and restores the decline vision. This happens at a rate of around 10% of the patients operated for cataract. The surgery can be done in the office without hospitalization. Complications are uncommon, but possible as with any other surgery. These may be a rupture of the outer shell (capsule) of the natural lens that holds the artificial lens. Usually this does not cause major problems if treated properly. Another complication is a postoperative astigmatism, which causes a slight distortion of objects and non-clear vision. Could appear due to the cornea incision. Is usually treatable and can be corrected with glasses or with a small surgery. The worst and most worrisome complication is an infection (endophthalmitis). Urgently treating with topically and systematically antibiotics is needed and in some cases surgery (vitrectomy) is required to fully clean the eye from the infection. It should be noted that the infections rate compared with the very large numbers of cataract operations is very small. There are no specific advices on prevention of the cataract. When there is an indication we should interfere at the right moment to avoid any difficulties caused by a mature cataract surgery. However, solar radiation can be linked to the pathogenesis of cataract, it is better to protect our eyes from the sun, from an early age with appropriate sunglasses, i.e. those that absorb the harmful UV rays. Finally, it should be remembered that the cataract operation is the most common and most successful surgery in the whole area of medicine. Latest generation of a retinal imaging system at Attiko Ophthalmological center.